BTC dropped again from $7100 area it dropped down to $6600 area, but look at DGD as king BTC drops it pumps and it shows the inversely proportional price movement of the each other. I mentioned this in my post yesterday that DGD is a good buy when BTC is approaching or near resistance level. Then now it happened again. 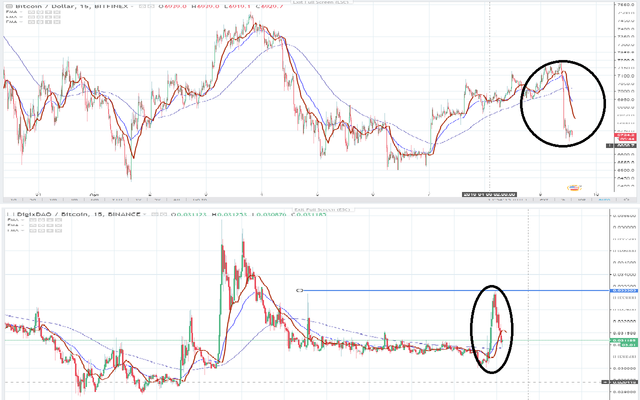 My other observation is that it went down this evening (Philippines Time) and if you're in a Western country it will be morning there probably 7am or 8am in the morning, I think this is the reason behind the drop, when the westerns woke up and they saw that they profited from their BTC trade because for example they bought it $6800 yesterday then when they saw its in $7100 area which is the current resistance of BTC right now, they will immediately sell it, because they are in profit, well its normal for a trader to take profits, but this maybe the reason for an immediate drop because they immediately sell their BTCs almost at the same time. 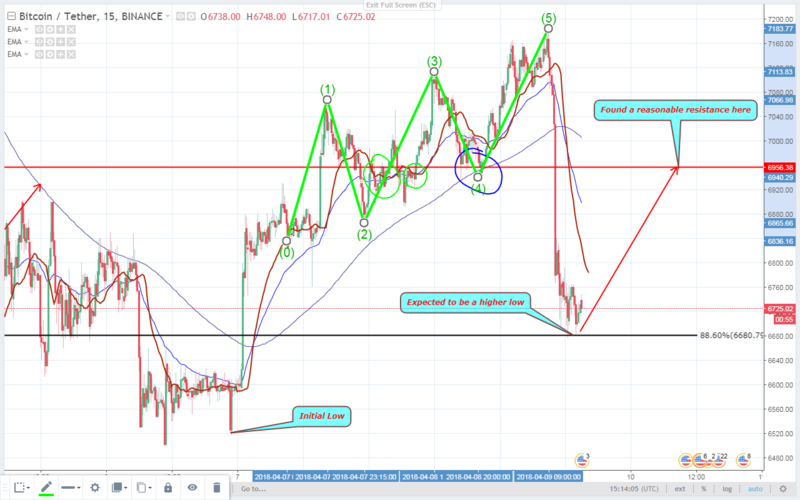 But if you look at my chart, it completed an Impulse Wave then it dropped as expected after a completion of a Wave, so for me this is good because you can say that BTC is following and respecting patterns. Based on my chart it bounced at 88.6% Fibonacci level and it bounced exactly and if this continues for the next few hour it will be a higher low for BTC. I hope that this is the last bear trap and there is a bull trap at 88.6% Fibonacci level. A reversal expected at that level as the chart suggests. we all hope for a bull run. Great analysis. Thank you for sharing. Upvoted!